Fireflies and summer go together. There is nothing better than watching fireflies on a warm summer night. It’s as if the stars drop from the heavens to float on earth. 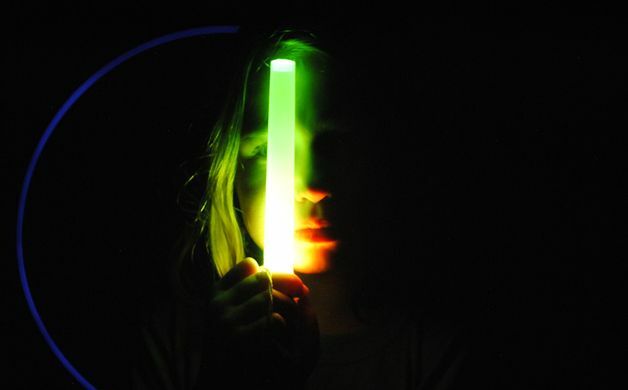 Be sure to give your kids the gift of firefly viewing before the summer ends. 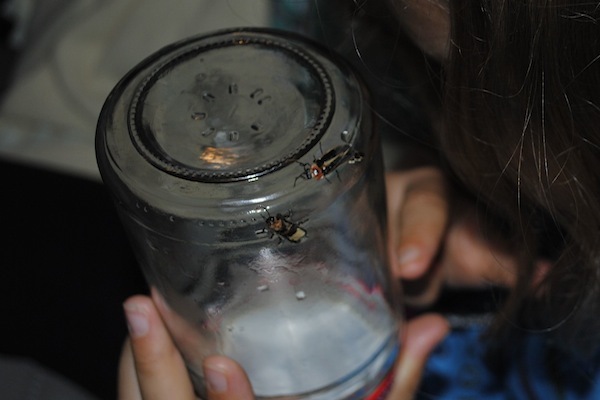 To help you enjoy fireflies with your kids, here are a few answers to the most commonly asked questions. Where can I find them? Fireflies are easy to find. They especially like moist, grassy areas at woods’ edge. I have them in my backyard. Look for fireflies throughout the summer with peak viewing in July and into August. Where do fireflies go during the day? Fireflies rest on leaves during the day and go unnoticed until dark. Can you spot them by day? Why do they flash their light? Fireflies flash light in patterns to attract a mate. The male of each species has it’s own light sequence that attracts females of the same species. So, when the male firefly, Photinus pyralis, beams a single half-flash during a forward rising flight movement that looks the letter "J," the female responds with a single flash. In general, males will not fly down to a female that sends the wrong species signal. But, some females of differing species have evolved the ability to mimic the response flashes of species other than their own. As the male flies down to a mimicking female, he is captured and eaten. Yikes! The male and female signal to one another until they meet, mate, and of course, live happily ever after, which isn’t very long. Fireflies only live long enough to mate and lay eggs. The female's eggs are laid a few days after mating, on or slightly under soil. The eggs hatch into larvae in 4 weeks. The larvae, also called glow worms, feed until fall on grubs and other insects until they burrow underground for the winter. How do they make the light? Fireflies are one of many species that are bioluminescent, that is they make their own light. The simple answer is that fireflies produce a chemical reaction inside their tails that allows them to light up. For the more scientific explanation, I turned to Firefly.org. Here’s what they say: “In a firefly's tail, you'll find two chemicals: luciferase and luciferin. Luciferin is heat resistant, and it glows under the right conditions. Luciferase is an enzyme that triggers light emission. ATP, a chemical within the firefly's body, converts to energy and initiates the glow. All living things, not just fireflies, contain ATP.” As I said, there’s a chemical reaction in the tail. How many different kinds of fireflies are there? Depending which research you read, there are between 160 - 200 different species of fireflies in North America. The number jumps to 2000 species if you add the world. Each species has its own unique flash patterns and habits. Do other light emitting animals flash? No, while many animals glow, fireflies are the only living creature that can turn their light on and off. Very cool. What is the coolest firefly in the United States? The synchronous fireflies, Photinus carolinus, are one of at least 19 species of fireflies that live in Great Smoky Mountains National Park. They are the only species in America whose individuals can synchronize their flashing light patterns. Every year, thousands of people travel to the park to see these fascinating insects do their thing. Is a Firefly really a fly? No, it’s technically a flying beetle. What’s a glow worm? A glow worm is the larvae of the firefly. The light serves a purpose. It signals to predators that they aren’t very tasty. Is the light hot? No. Fireflies are efficient light machines. No heat is produced from the light. If it did, they wouldn’t be able to survive the heat. What do fireflies eat? Scientists think that adult fireflies may eat pollen and nectar, but because of their short life cycles, they may eat nothing at all. Are fireflies declining in numbers? Yes, habitat decline and light pollution may be reasons for the decline. 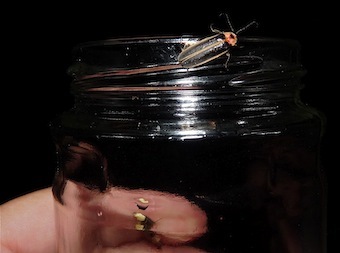 Observe them in a Jar: To get a closer look at a firefly, gently place it in a jar and wait for it to light up. See if you can identify it’s pattern. Keep in mind that fireflies are hard at work so don’t keep them too long. Note: I tried this and found that the fireflies didn’t blink in the jar. I used a small peanut butter jar, so you may want to try a larger jar. Use a net if you can. If you do touch them, don’t have insect repellent on your hands. Read a Book about Fireflies: The Very Lonely Firefly by Eric Carle is good for younger children. Older children will enjoy reading about the science of fireflies. Try Fireflies by Sylvia Johnson or Fireflies by Bernice Kohn. 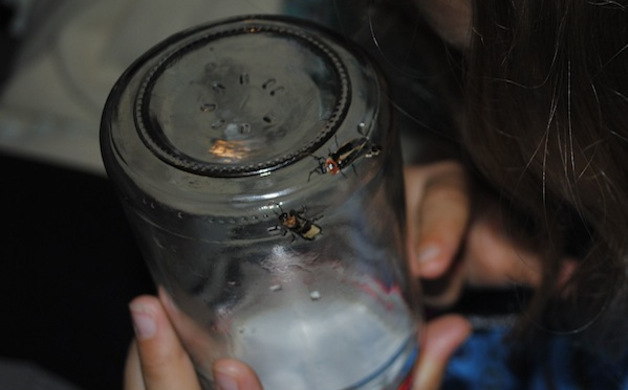 The Science Museum of Minnesota sponsors Firefly Watch, a program to help scientists learn more about fireflies around the globe. Firefly numbers are declining and there is concern. You can sign up for Firefly Watch here. Make a Firefly Craft: Place a glow stick inside a pop bottle and add paper wings and pipe cleaners for legs to make a cute glowing firefly. 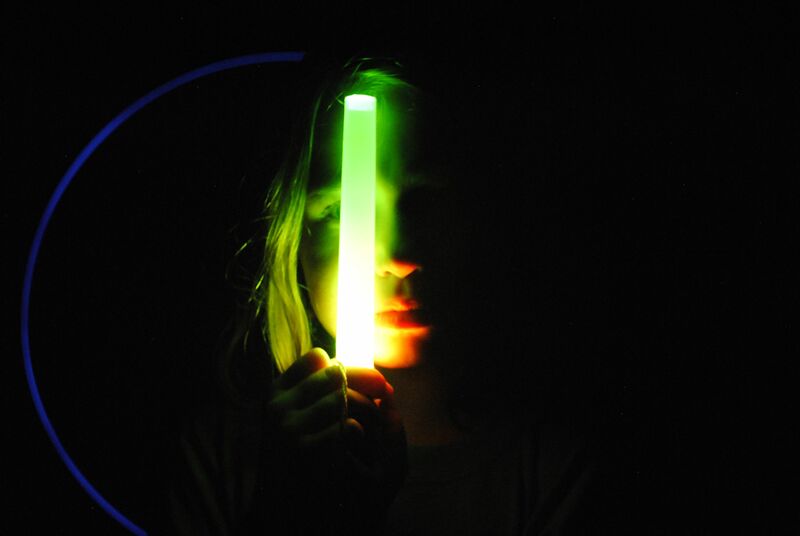 Use it as a night light on a camping trip or in your bedroom. Study Other Glowing Animals: Study other animals with glowing properties. Where do they live? Why do they glow?